The 100 best Beatles songs – number 15 – Help! 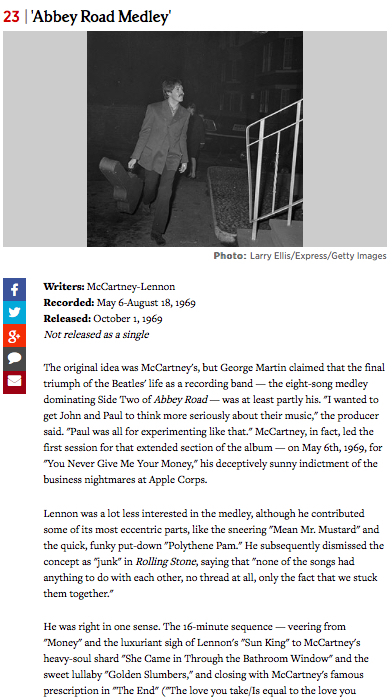 At number 15 in Rolling Stone Magazine’s list of the 100 greatest Beatles songs is “Help!”. This John Lennon song is literally that, a cry for help. Lennon wrote it when he was depressed over the winter of 1964/65. It was recorded in April 1965, and was released as a single in July of the same year. It is also the opening track of their album Help!, which was released in August of 1965, a week or so after the movie of the same name was released. Not surprisingly, Help! got to number 1 in many countries around the World, including the USA and Disunited Kingdom, but also Canada, Ireland and the Netherlands. Here is a live version of Help!, performed on a British TV programme some two weeks before the famous concert at Shea Stadium. Enjoy! At number 16 in Rolling Stone Magazine’s list of the 100 greatest Beatles songs is “I Saw Her Standing There”. This song was recorded in February 1963 and released on their debut album Please Please Me in March 1963. It is the opening track on their debut album, and was never released as a single in the Disunited Kingdom. However, in the USA it was the B-side of their debut single released by Capitol Records, with “I Want to Hold Your Hand” on the A-side. This single was The Beatles’ breakthrough in the USA, getting to number 1 in January 1964 and staying at number 1 for 7 weeks. The song, written mainly by Paul McCartney but with some contribution from John Lennon, was written in 1962. McCartney scribbled the lyrics in a notebook from the grammar school that he had attended as a teenager. Here are The Beatles performing “I Saw Her Standing There” live. Enjoy! At number 17 in Rolling Stone Magazine’s list of the 100 greatest Beatles songs is “Ticket to Ride”. This song was recorded in February 1965 and released as a single in April 1965. The B-side to the single was “Yes It Is”. Unusually for a Beatles single, it was also included on an album, in this case their 1965 album Help!, but this is more because the song is in the movie, and the album was essentially a soundtrack of the movie. 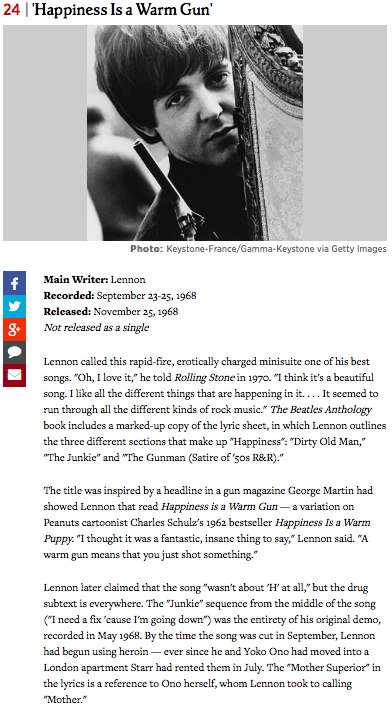 According to the screen-capture of the Rolling Stone blurb below, its writers were Lennon and McCartney. I defer to their greater knowledge, but I have always thought of “Ticket to Ride” as a John Lennon composition. He certainly takes the lead vocal, and its style is very much Lennon rather than a collaboration between him and McCartney. The single got to number 1 in the Disunited Kingdom, the USA, and many other countries. Here are the lyrics for this great song. It is one of my favourite Beatles songs from 1965. Here is a version of “Ticket to Ride” being performed live by the Beatles in 1965 concert at Wembley Stadium, as part of the New Musical Express Poll Winners Concert. Enjoy!